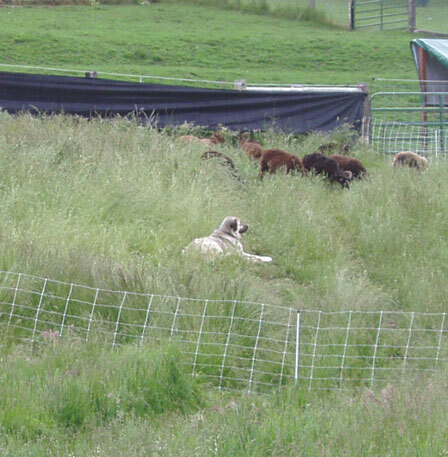 Everyone here at Saltmarsh Ranch, animals and shepherds alike, heaves a sigh of relief each spring when the sheep and their guardian llamas first move out of their winter hay feeding areas and onto pasture grass. To be sure, the sheep cannot help but gorge themselves, creating havoc with their excretory functions but putting huge smiles on their faces and ours. It is a ritual we never tire of. It would be a straightforward matter, and frankly make life in April and May easier on the shepherds’ daily routine, if we simply put the sheep out to pasture as soon as the grass starts turning green and quit lugging hay around. The sheep would be elated. Spring is when they get not only live grass, but also their favorite delicacies, the new growth of poison oak and blackberry leaves. Each year we are tempted by the simplicity and the intuitiive correctness of getting the sheep onto grass as soon as possible. Shove them out of their winter living quarters, a small section of the fields where they appear to create a desert wasteland out of a perfectly nice stretch of pasture and where they consume hay at a rate calculated to create heartburn in the resident accountant. 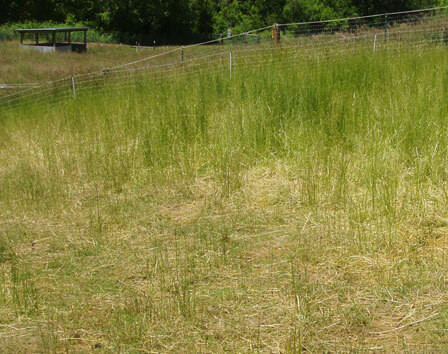 The same terminology used for haying — first cut, second cut — applies to our pastures. When the sheep make their “first cut” in a section of grazing area, they leave a lot of stemmy grass behind. 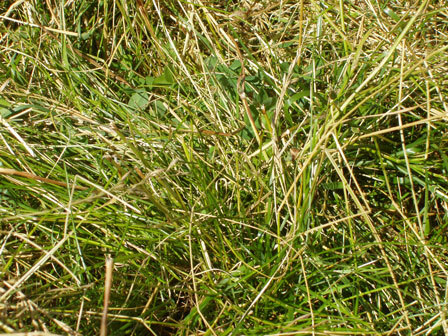 First grass growth is the plant’s reproductive phase. (Note: I have no idea what the correct botanical terms are, but if anyone reading this is bothered by the casualness of my word usage, please feel free to comment and I will update this post). The plant concentrates its energy on making seed and the stiff stalk, I believe called “carrying stock,” that holds the seed heads high off the ground where the wind can blow the dry seed across the pasture so that come next spring, a whole new crop of grass will appear as if by magic. There is not much leaf on the grass at this point; that comes later. We were surprised to find a lot of the seed-laden stalks left untouched by the sheep. They really are looking for the soft leaf growth, such as it is at first, down by the ground. Their preference against the seeds seems odd considering how much the sheep love other grains (oats, corn, barley) and how rich in protein those grass seeds must be. I mentioned it to a professional landscape friend of ours yesterday. She too was surprised but surmises the seed heads contain something icky-tasting (from the sheep’s perspective) that serves to protect the seed from being eaten before it can get to the ground, rest for the winter, and then germinate in the spring. It is this reproductive phase of the grass plant that explains why we see the almost ghost-like appearance of the pasture after the Soay make their first pass through — nothing but a lot of greenish-brown sticks topped with fronds of seeds. And the need to make seed first, and then leaves, serves as a caution against putting the sheep out too soon. We need to let the seed growth and dispersal happen first, or next year we will not have a lush new pasture. We could knock down the seed stalks with a mower and make the pastures look tidier, but our timing would have to be at a level of precision — too soon and the seeds are not mature, too late and our sheep miss days on grass — we prefer to avoid when we can. Better to let the sheep tromp down the seed stalks; their little hooves are just the right size to act as miniature ploughs poking the seeds into the ground. Back then, I was bragging about our expertise in pasture rotation. Compared to last year’s lush green, it sure looks like the shepherds at Saltmarsh managed to ruin a perfectly good pasture, doesn’t it? But wait. Let’s look beyond those dry stems leftover from the Soays’ “first cut” a couple of weeks ago. Here is how that same section looks up close 18 days later. You can still seeing the drying stems, but now there is a wonderful new layer of vegetative growth down closer to ground level. Not only is it green, it is a good mix of various grasses and nitrogen-fixing clover. When we return the ewes to this area in a few weeks, their little feet will trample the remaining dry stems as they work their way through the new growth. Another temptation in the spring, and throughout the summer actually, is to leave the sheep in an area for more than four days. Big mistake. Regular readers will recall that grass begins to regrow four days after it is cut/eaten. Actually, I was told by another breeder in Wisconsin that he has to move his animals every three days — must be the effect of all-summer-long rain. But whether it is three days or four days where you live, if the sheep remain in one area longer than that, they will begin eating the new growth and the pasture will not recover as quickly or as well, nor will the new vegetative growth have time to store nutrients in the roots for next spring’s reproductive growth. The cycle continues. And here is where Electronet comes in so handy. It allows us to make larger feeding areas for our groups during the spring and early summer to ensure the sheep eat down the grass to the right level, and then shrink the areas later in the summer when the grass growth slows down, but still allowing the proper amount to be eaten. Now that our flock, including the newly-weaned lambs, are busy making their way, 3 or 4 days at a time, through all the sections of our pasture, both sheep and shepherds reap the benefits of waiting for the grass to get a good start before starting the rotation a bit later in the spring. Remember the old folksong, “green green, it’s green they say”? Green it is on the near and far sides of our hills … for now. 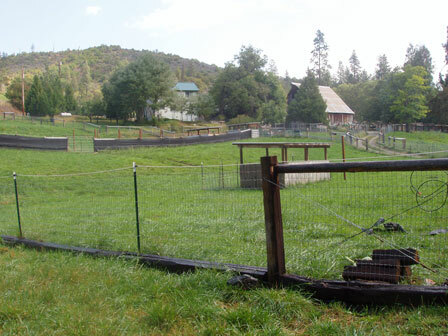 I solve the problem of wanting to put the sheep out onto pasture at the first sign of green grass by making a temporary spring-pen in my garden area. There, the sheep can eat fresh grass to their heart’s content, and the less of it that grows back in my garden after I’ve moved the sheep to their summer pasture, the better. Thanks for the great suggestion, Elizabeth. And perhaps if the sheep get the winter growth in the garden down far enough I will be inspired to resume gardening — watching the lambs grow in May and June seems like more fun than weeding the tomato patch and watching the gophers work their way down the row of potato plants taking just one or two bites out of each potato. I wonder if our LGDs could be re-trained as garden guardians?